One – Leather is a difficult material to take care of. To keep your leather jacket in good condition, you should learn the basics of cleaning and caring for leather. You may not only have leather jackets to care for, but other leather garments and household items to care for as well. These cleaning tips can be used for leather gloves, skirts, belts, and handbags, as well as leather furniture, car upholstery and other leather goods. Two – With normal wear, a smooth surfaced leather jacket only needs to be thoroughly cleaned and reconditioned once a year. To clean a smooth surfaced leather jacket, use a mild soap or detergent. Wipe the jacket on its entire surface with the detergent on a dampened cloth. Rinse with a clean, damp sponge, and pat off any excess water on the jacket. You should then let it dry on a hanger where there is plenty of air circulation. You can spot clean with a damp, soapy rag the rest of the year. Three – To prevent drying and cracking, you will need to condition your jacket. Rub a little bit of mink oil or leather conditioner into the leather to prevent drying and cracking. Use only enough to coat the entire jacket, but not enough that it feels sticky. If you need to dry clean leather, be sure you take it to a cleaner that specializes in cleaning leather garments. Four – To care for a suede leather jacket, make sure it has been sprayed with a water and stain protector when you first purchase it. Regularly brush suede with a suede brush, or a terry cloth towel. This will keep it clean and raise the nap. The smooth interior of the jacket should be conditioned with a leather conditioner. Stains on suede can sometimes be removed carefully with a pencil eraser or very fine sandpaper. If you get water spots on a suede jacket, you should first let the jacket completely dry, and then rub it with a terry cloth or suede brush. Five – All leather jackets should be hung, and never folded, as folding can cause creases in the leather. Use padded or wooden hangers to prevent any indentations that might be caused by a wire hanger. If your leather jacket does get creased, remove the creases by hanging in the bathroom after running a hot shower, to let the steam work out the creases. Creases can also be removed by ironing your leather jacket on a low setting. Make sure to use heavy paper between the leather and the iron. 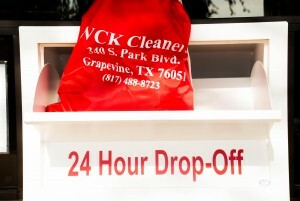 One – Drive up to WCK Cleaners drive thru window and drop off your leather garments. 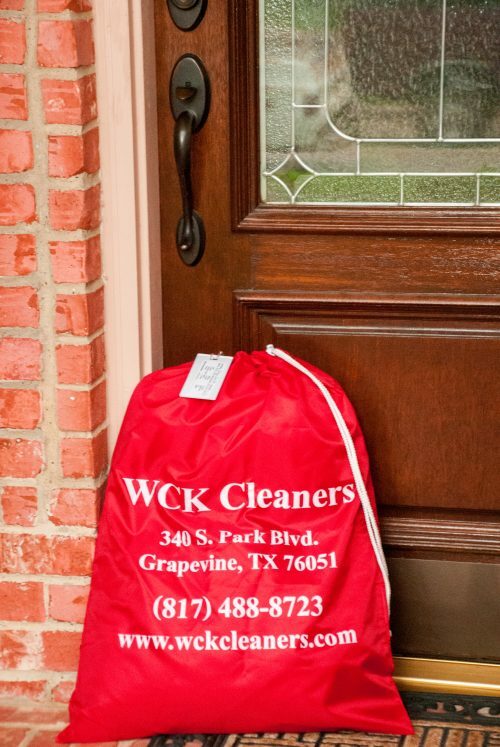 Two – Drive up to WCK Cleaners drive thru window and pick up your leather garments.